Homeschool planners are a very important part of homeschooling. Not being well planned is like going on a road trip without a map, you may get there but how many detours are you going to take along the way? While detours are not always bad, you may just get lost and never find your way to your destination. You don’t want to get lost when your homeschooling, you need a road map, and that is exactly what a great homeschool planner can do for you. There are different types on planners and not all of them will fit for everyone. Today I am going to share a few planners that I have used. I have used free planners, online planners, and calendar book planners, all of which have their pros and cons. Online planners are usually subscription based. I like the cloud feature of most planners, I can log in from any device and see our calendar. This makes it easy to customize our days if they do not go as planned. Most planners cost about $9.95 a month or there are yearly subscription options that can save you money. My only tip before you pay for the year is to make sure you love the planner before you pay, try the free trials. I just wrote a full review of this planner here and highlighted the planner in a homeschool 101 post here. I currently use this planner and subscribed to it before my review. This by far is my favorite planner. You can add subjects, notes, classes, students, customize your calendar easily, and so much more. You can also print transcripts, attendance, lesson plans, and your students work assignments. Read the full review to see! The monthly subscription rate is $6.95 or a yearly rate of $65.00. They offer a free trial for 30 days, go check it out! I tried the free 30 day trial and liked this planner as well, but it has a learning curve that takes some time to learn. Plan to spend a few hours learning how this planner works and adding students. This planner can be accessed from most devices, and is a life planner as well. You can also print transcripts, attendance, lesson plans, and your students work assignments. The introductory rate for a yearly membership is $49.99 until 9/1/2015 then it will go up to $64.99. I do not think there is a monthly subscription. I previously bought the software that Homeschool Tracker sold a few years ago and I really liked this planner, but now they do not sell the software and just have a subscription based planner. I tried this new online planner for a month and decided it was not for me. It was not like the software that I loved. It was very hard to understand, how to add students, subjects, lessons, and so on. I was not able to print everything I wanted to print as well. I was really let down with this new planner. I emailed and asked for a refund. The subscription for a month is $7.50 and yearly $59.00. I would definitely try a month before purchasing the yearly rate. I purchased these planners for our home last year for planning out our weekly lesson plans. I love the quality of these planners and how easy they are to use. They also offer homeschool inspiration throughout the planner. I purchased the Well Planned Day for my self and then each child their own student planner. The only thing I wished this planner had was more room to write notes for the assignments. The teachers planner included attendance sheets for students, and report cards that could be torn out and stored. I really liked these planners. These are very affordable planners that you will print off and either use a binder to create your planner, or you can take these to be spiral bound at your local office supply store. I like the ability to print off just the pages I need and to print more if I need them. They are colorful and fun. The prices range from $5 to $3.99. If you haven’t found Erica’s website www.confessionsofahomeschooler.com you are really missing great reviews and more. She also sells curriculum that is so much fun to use, we own the K4 and Road Trip USA and we love them. 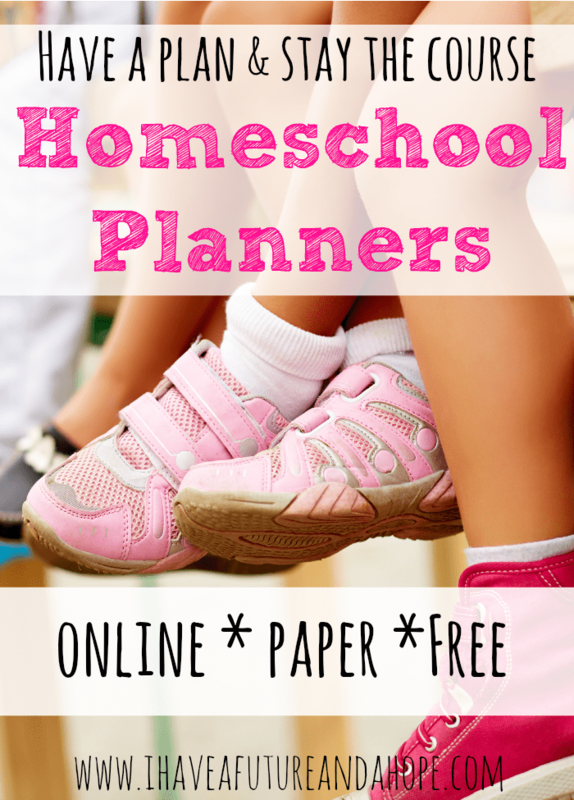 There are a ton of free homeschool planners on Pinterest and when you Google search. I encourage you to search and find one that is easy to use and has plenty of room for lesson planning. Most of these can be printed and then taken to an office supply store and spiral bound for a few dollars. No matter what type of planner you use make sure you have a road map for your year, you don’t want to take a wrong turn and wind up driving off a cliff!